1. A lack of agreement or balance: "There is a discrepancy when there is a difference between two things that should be the same." 2. A divergence or disagreement; such as, between facts or claims; a difference: "There are discrepancies between the results of the two research results." 3. Etymology: from Latin discrepantia. 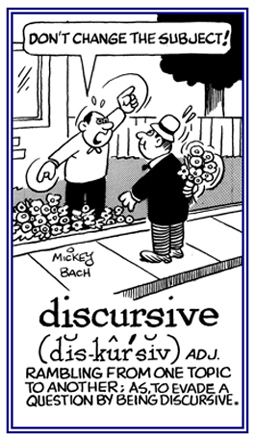 "discordance, discrepancy", from discrepantem, discrepans, discrepare, "sound differently, differ"; from dis-, "apart, off" + crepare, "to rattle, to crack, to creak". Completely separated and unconnected; that is, disconnected from others; distinct or separate: Charity and compassion are considered to be two discrete qualities. Most learning processes can be broken down into a series of discrete steps. 1. To treat one person or group worse than others or better than others; usually, because of a prejudice about race, ethnic group, age group, religion, or gender. 2. To pay attention to subtle differences and exercise judgment and taste accordingly. 1. Referring to the ability to identify subtle or very small differences and having an appreciation for good quality or taste. 2. Used to describe tariffs that are set at different rates for different importers. To free from blame or the imputation of a fault; to exculpate. Pertaining to a lengthy and a wide field of subjects, or topics including extra material which is not necessary to what is being written or spoken about: The speaker at the convention gave a discursive presentation that wandered from one topic to another one about information which was not relevant to the main subject. © ALL rights are reserved. A reference to talking or to writing about many different things in a way that is not highly organized: Glenda's sister is a newspaper reporter who avoids any tendency to discursively write contents that are not well structured and well planned. 1. To talk about a subject with others: "We need to discuss it with the others first." 2. To consider a topic in speaking or writing: "He wanted to discuss the procedures described in the book." 1. Someone who speaks or talks over a subject with another person or with others. 2. Anyone who examines or considers (a subject) for a speech or writing. Showing page 13 out of 35 pages of 513 main-word entries or main-word-entry groups.